This is a widely distributed bug that occurs in a range of still-water habitats, usually with emergent vegetation and a fairly high concentration of organic matter in solution. H. linnaei overwinters as an adult and lays eggs in March – April, which are attached to aquatic plants by an egg stalk. The map is based on records from NBN Gateway, with yellow dots showing pre 1990 records, reds dots 1990 – 2017 records and red on yellow dots overlapping records. 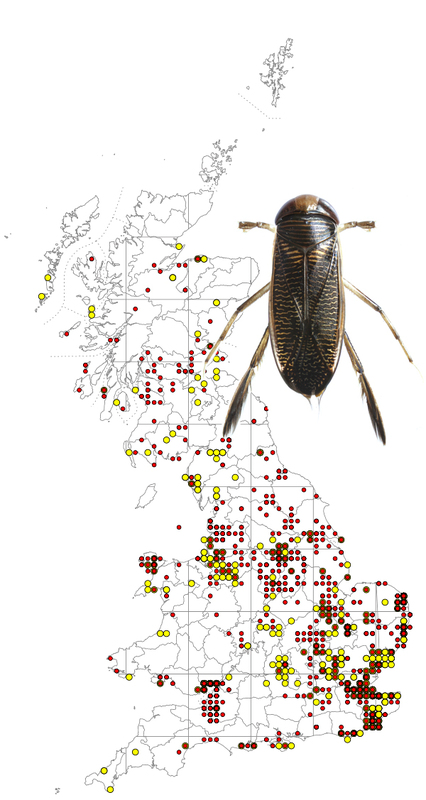 Hesperocorixa linnaei has been recorded throughout most of the UK and Ireland. Hesperocorixa spp are distinguished from other groups of lesser water boatmen (Corixidae) by the pale lines on the wingcase which are narrow and extend more or less unbroken across the black background. In the case of the two larger species H. linnaei (7.0 – 8.0 mm) and H. sahlbergi (7.0 – 9.0 mm), there is a distinct contrast between the pale lines and the black background. In the two smaller species, H. moesta (5.5 – 6.0 mm) and H. castanea, there is little contrast. In all species the metersternal xiphus is much longer than its breadth at the base (see image below). H. linnaei can be distinguished from H. sahlbergi by the six pale lines on the pronotum (H. sahlbergi has 7-9) and the pattern of light lines on a dark background extending to the posterior apex of the corium (in H. sahlbergi the dark pigmentation fades near the apex).